We got up around 6.00 am again. It was a fine sunny day. Don made coffee for himself and a cup of tea for me and we followed our normal routine to the packing up stage. After a Muesli bar breakfast we set off from Reibersdorf along the Radweg which passed in front of the Gasthaus. 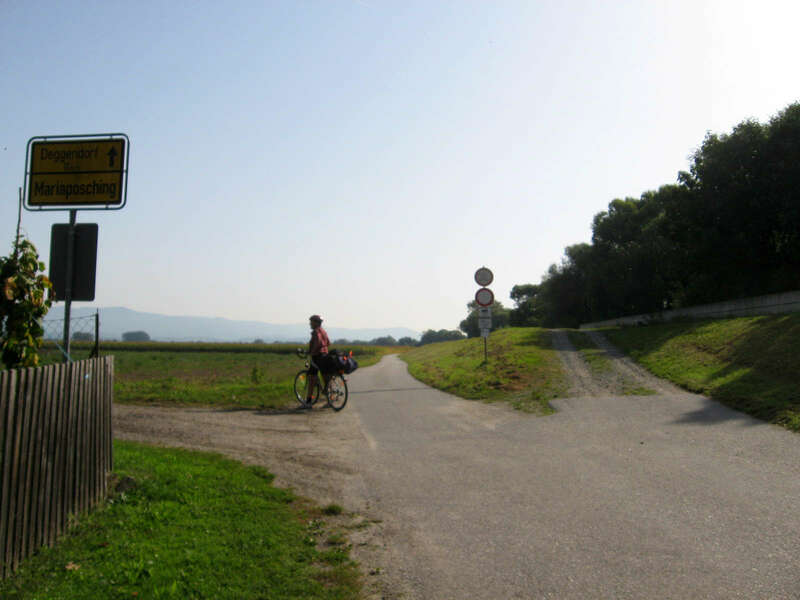 It was cool and the track to Bogen was fine with a gradual uphill. 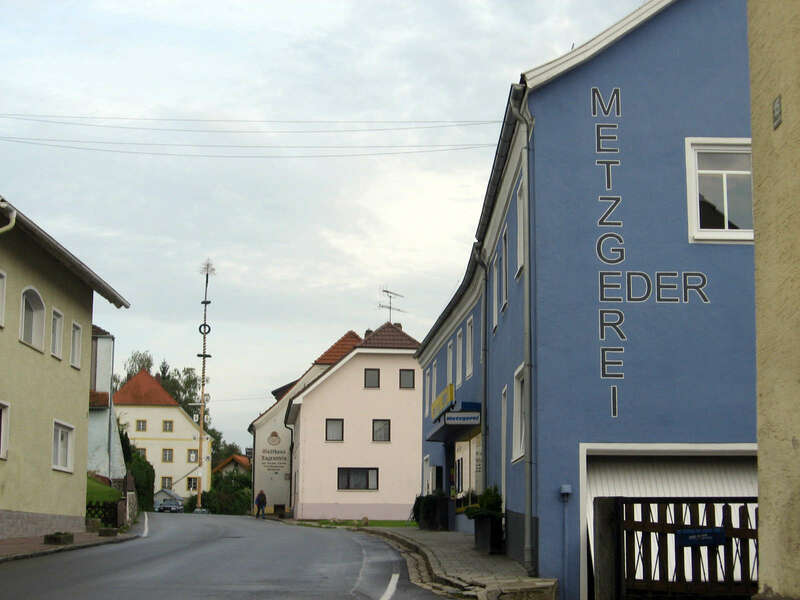 We managed to bypass Bogen after buying rolls and drinks at a Baeckerei in the main street. 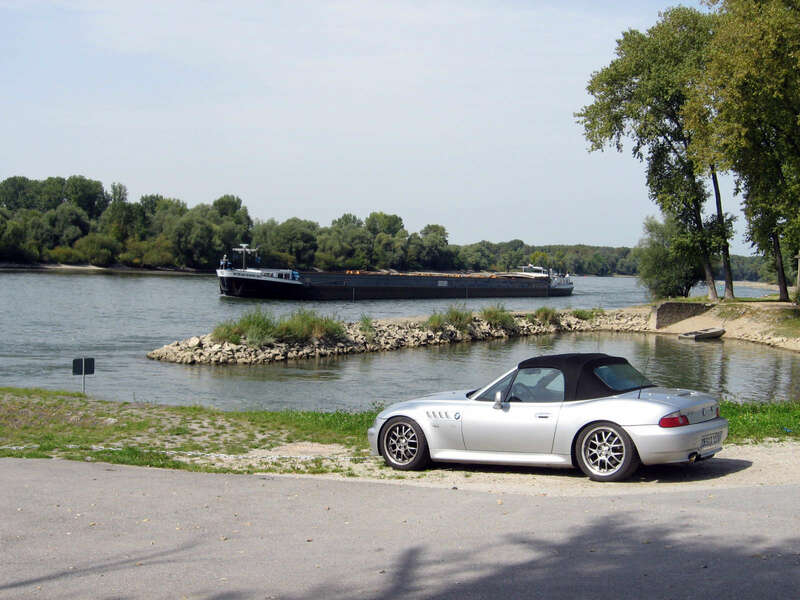 We were able to sit on high gear all the way to Mariaposching following the river and levee bank which was great. The surfaces were quite variable but were pretty good on the whole. 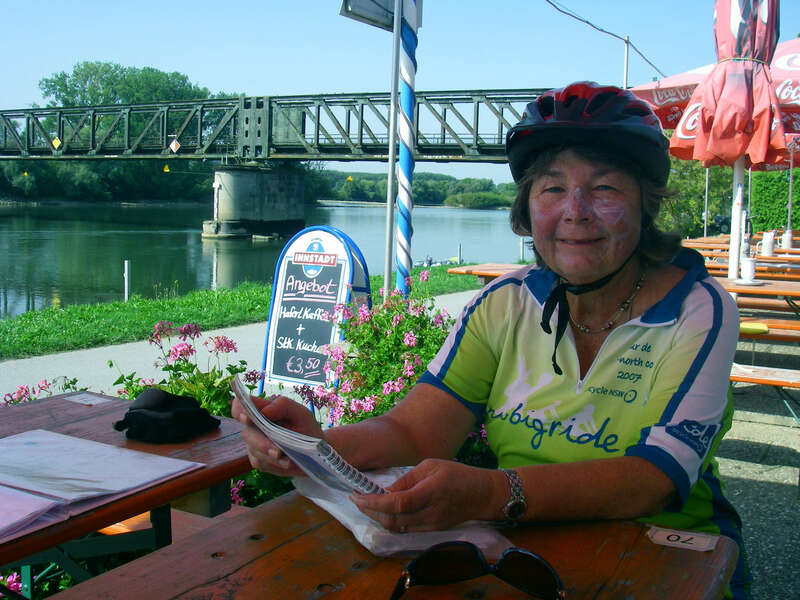 On the way to Deggendorf we stopped to have breakfast. Don took some panoramic views to illustrate the type of countryside we were now riding through. 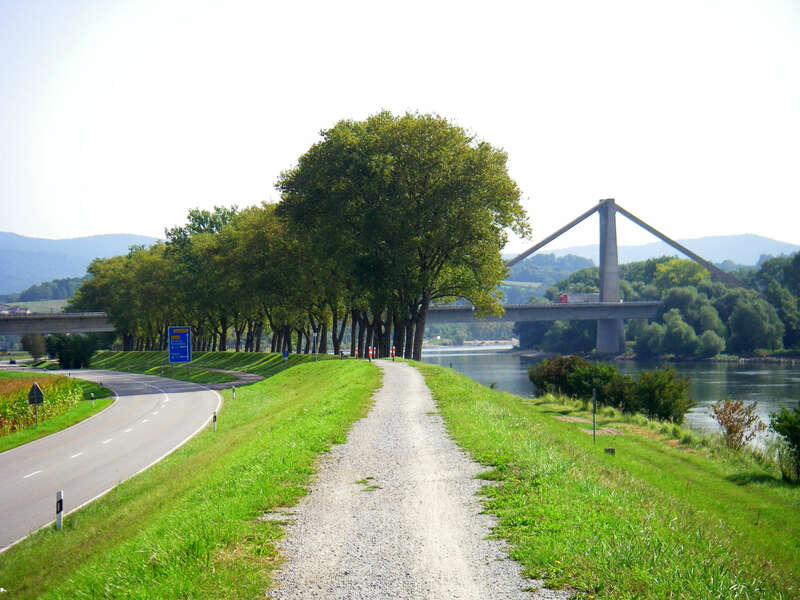 The levee banks were a great way to travel. 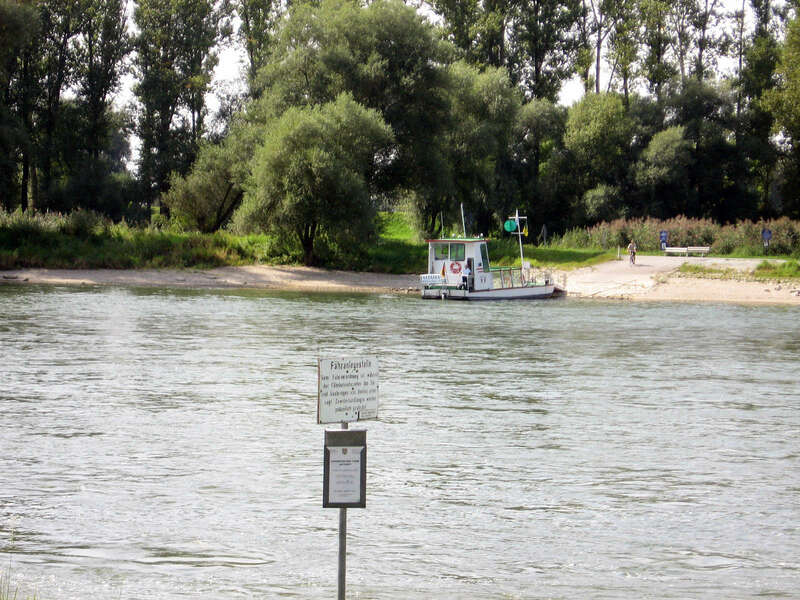 We stayed on the left bank all the way but there is an alternate route from Hofweinzier across the river to Irlbach. 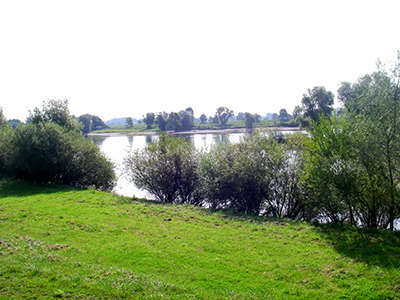 360° panorama on the Radweg. I climbed up on the levee bank to get this shot of the really flat environment beside the Donau. 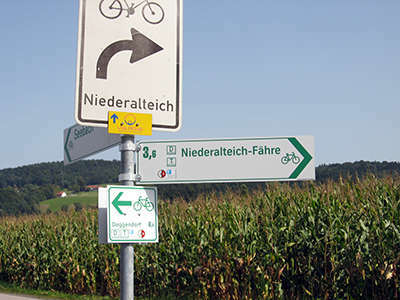 The signs were often very informative. 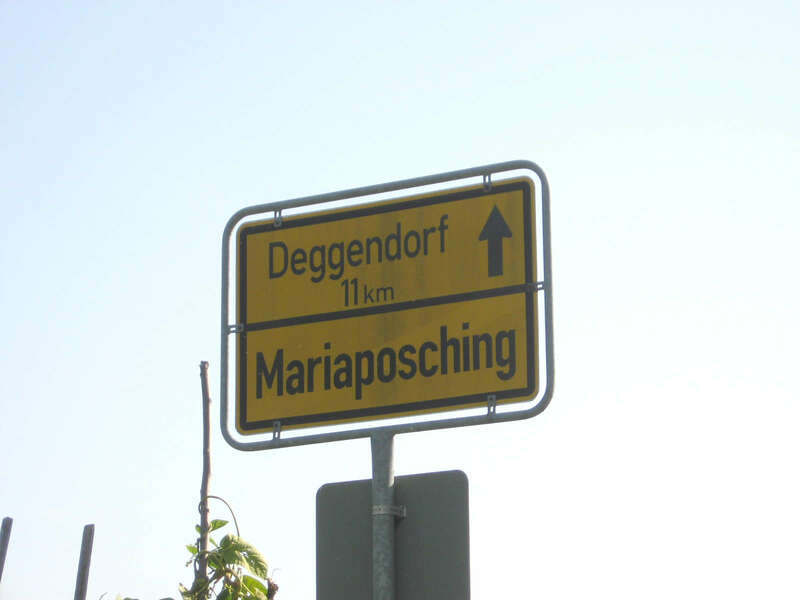 This one means that we are at Mariaposching, and Deggendorf is 11 km away. 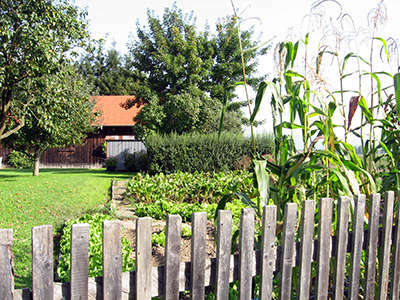 Many of the houses had extensive vegetable gardens, and usually some apples or other fruit trees. 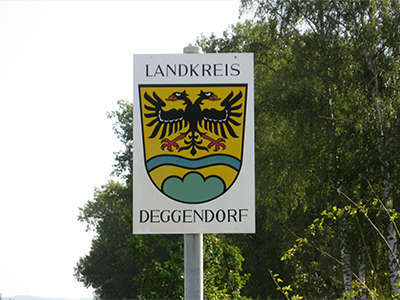 We got to the edge of the Deggendorf area about 15 minutes later. 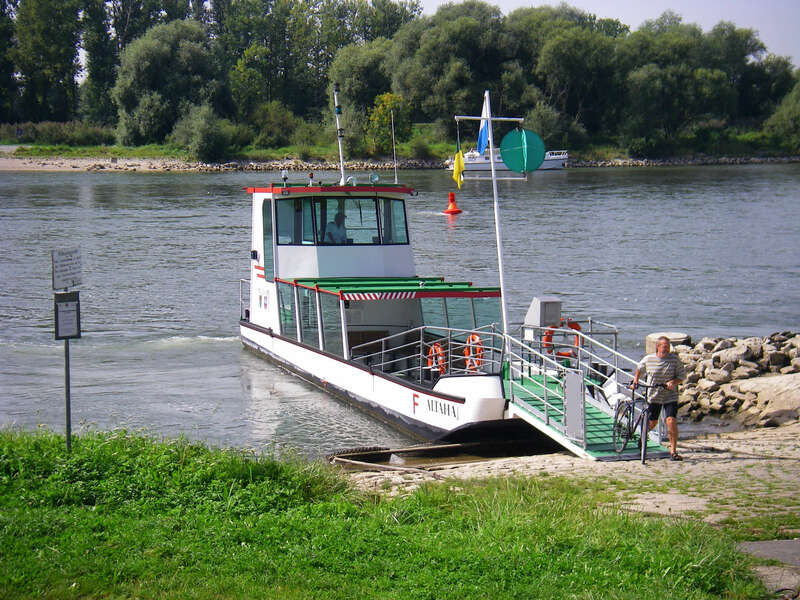 The Danube is a wonderful wildlife refuge. 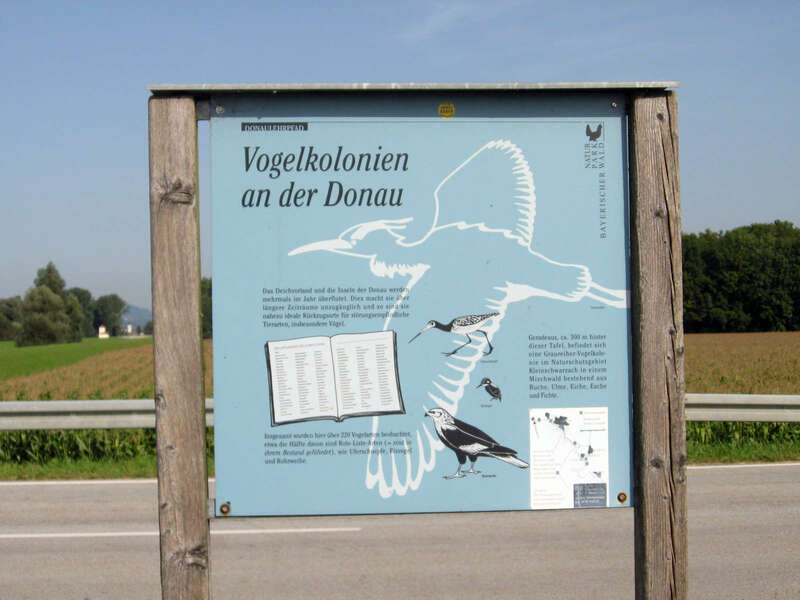 Birds are the most obvious beneficiaries, but there must be many other organisms including such animals as voles and frogs, as well as insects and other invertebrates, that benefit from this resource. 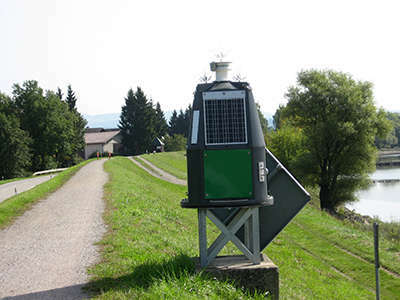 This is an automatic solar powered Donau river level recorder. 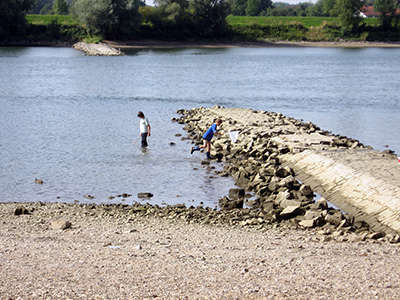 These groynes have been put in to protect the river bank during floods. I had a lot of trouble with the gears, and had to remember to change down before stopping, or before a big hill, to avoid the chain coming off. 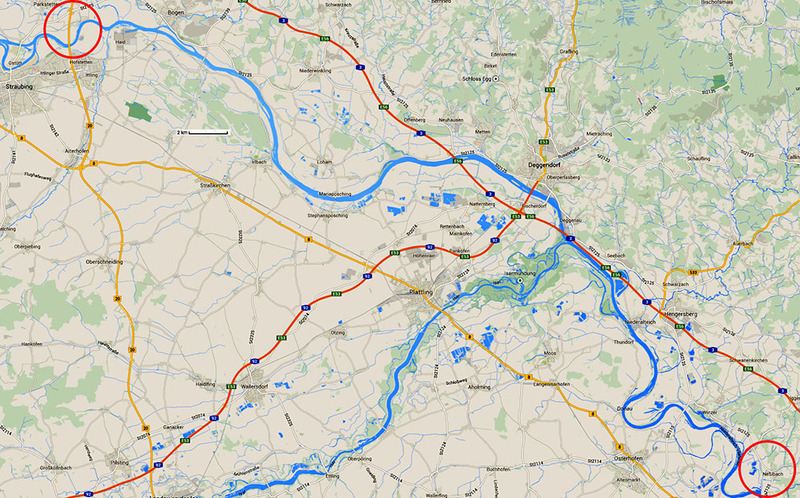 We followed the river. The radweg usually goes under the approaches to the major bridges. These boys were having a great time mucking about at the river's edge. 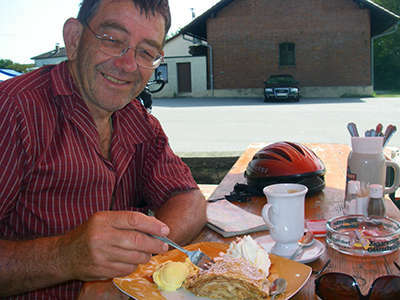 A tradition we gladly adopted was the morning kaffee und kuchen! 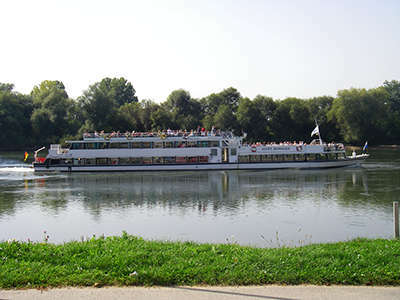 At this point in the river there were many cruise boats, this one named the Agnes Bernauer. Agnes Bernauer (ca 1410 – 12 October 1435) was the mistress and perhaps also the first wife of Albert, later Albert III, Duke of Bavaria. 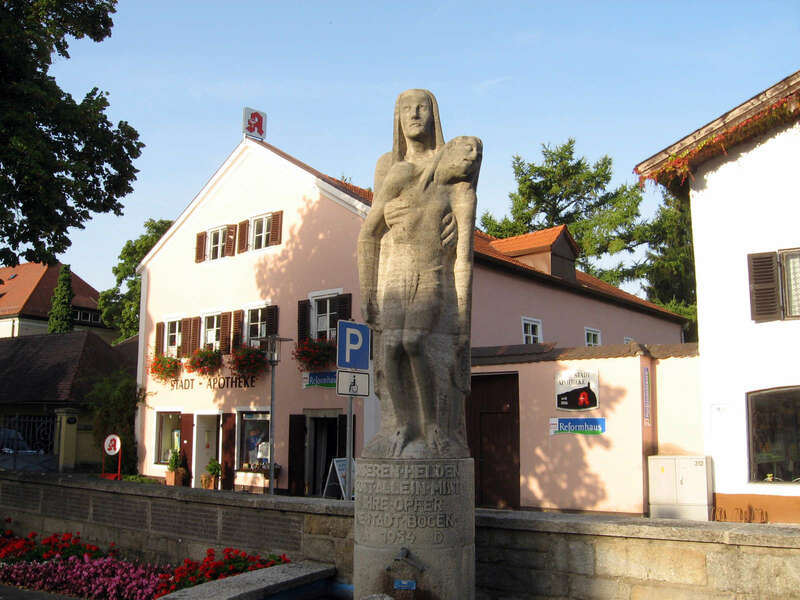 Because his father, Ernest, ruling Duke of Bavaria at the time, considered this liaison with a commoner unbefitting his son's social standing, he clashed with his son over the matter and finally arranged to have Agnes condemned for witchcraft and drowned in the Danube in 1435. Her life and death have been depicted in numerous literary works, the most well known being Friedrich Hebbel's tragedy of the same name and the folk musical Die Bernauerin by the composer Carl Orff. It got a bit messy getting out of Deggendorf as we tried to avoid the main part of town. 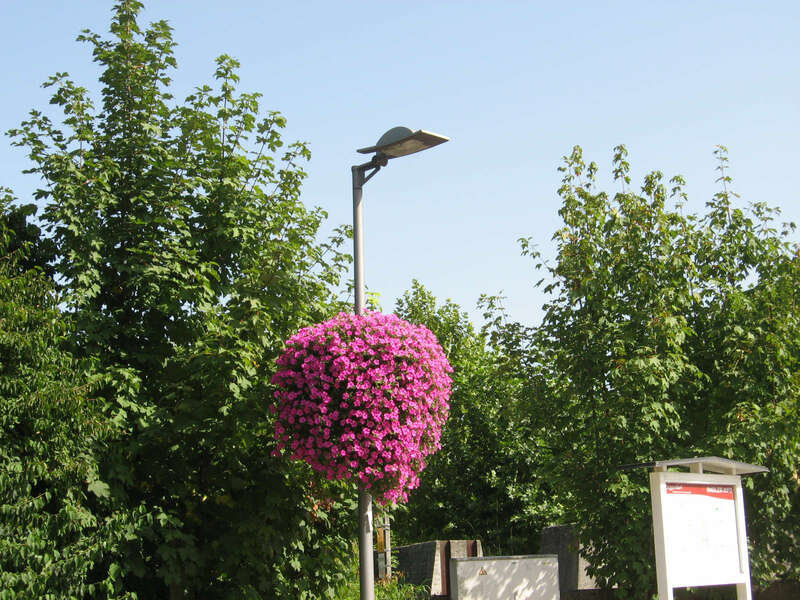 I loved the floral arrangements on these lampposts. The German- speaking countries are masters at this. Everywhere you look in southern Germany, Switzerland and Austria there are flowerboxes full of the most gorgeous coloured geraniums, petunias and other annual flowers. It's such a celebration of summer. 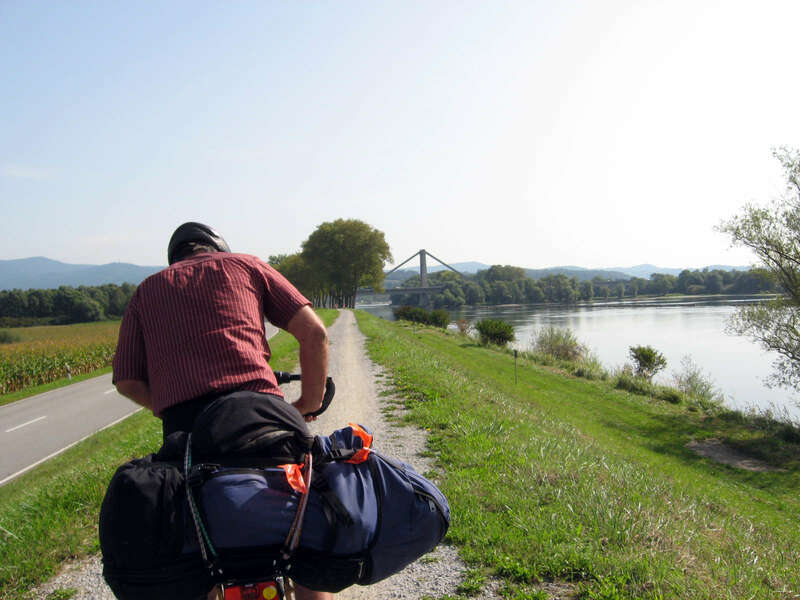 We picked our way past an industrial area and followed the main road till we were able to cross it and ride down to the river again. 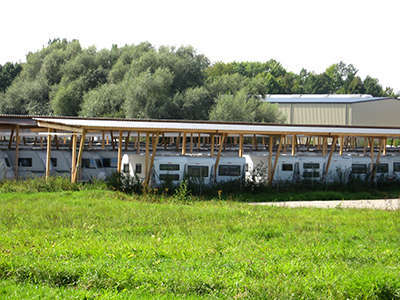 Along the way we saw many farm buildings covered with arrays of photo-volataic cells. 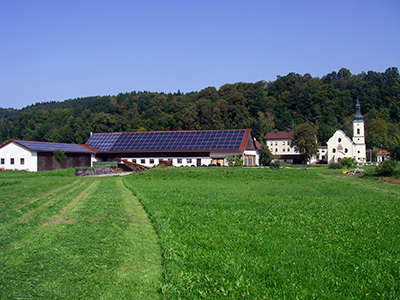 The Germans have an excellent program of encouraging solar power which is lucrative for the owner. It has even been suggested that some people have hired farm roofs to take advantage of the investment opportunities. One lovely tradition is the custom of decorating poles and balconies with flowers. 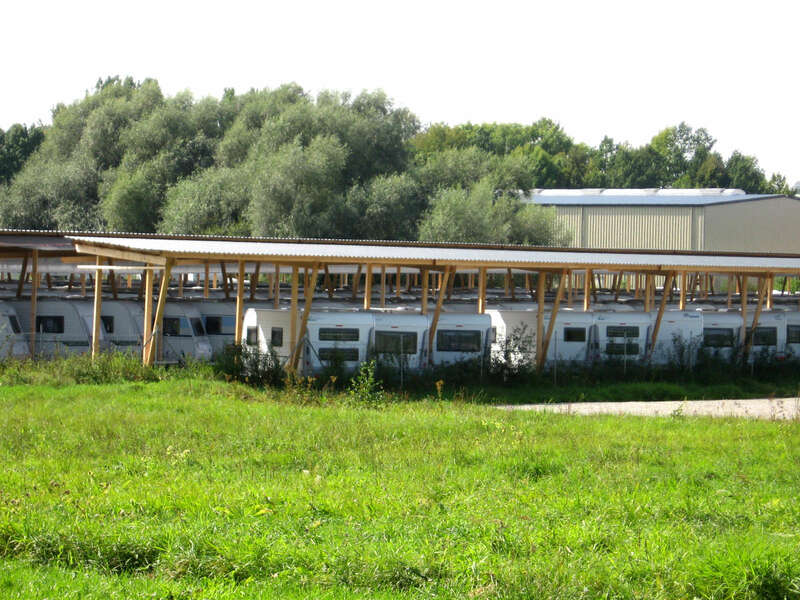 This appeared to be a parking area for caravans used by people who did not have room to park them at home. 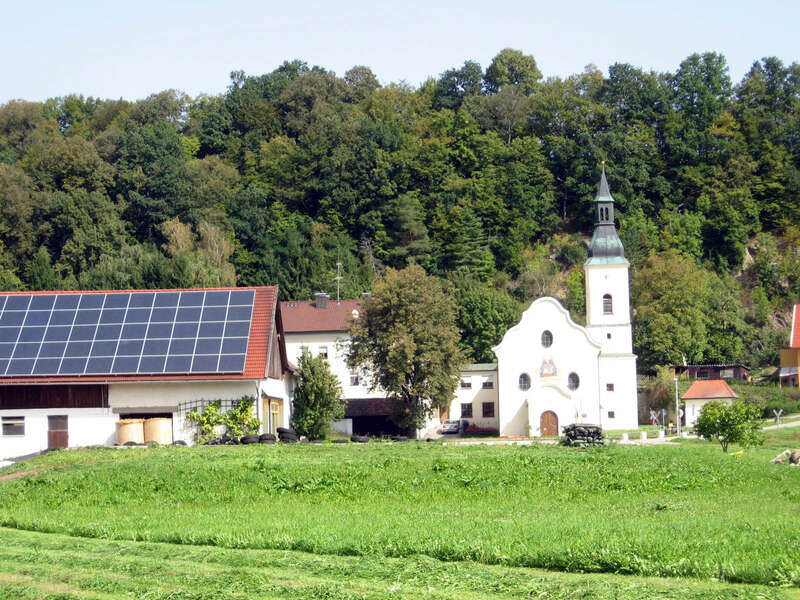 We began to see more and more roofs covered with photovoltaic panels. We were told that people rented the roof space from farmers, and put the solar panels up as an investment. 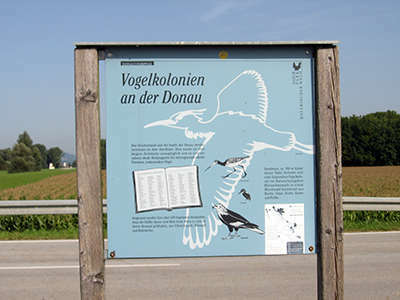 The signs are important, since there are multiple Donauradwegs. 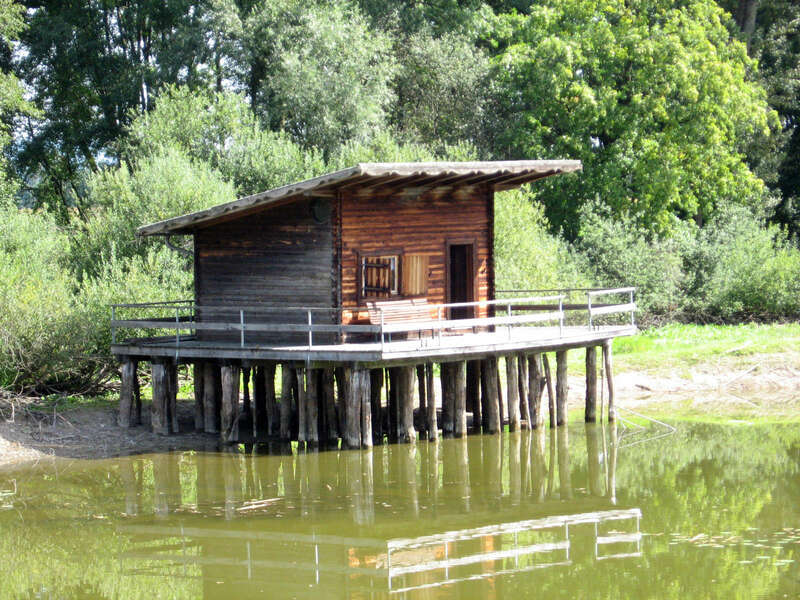 This little cottage had the bargeboards decorated in the traditional way. 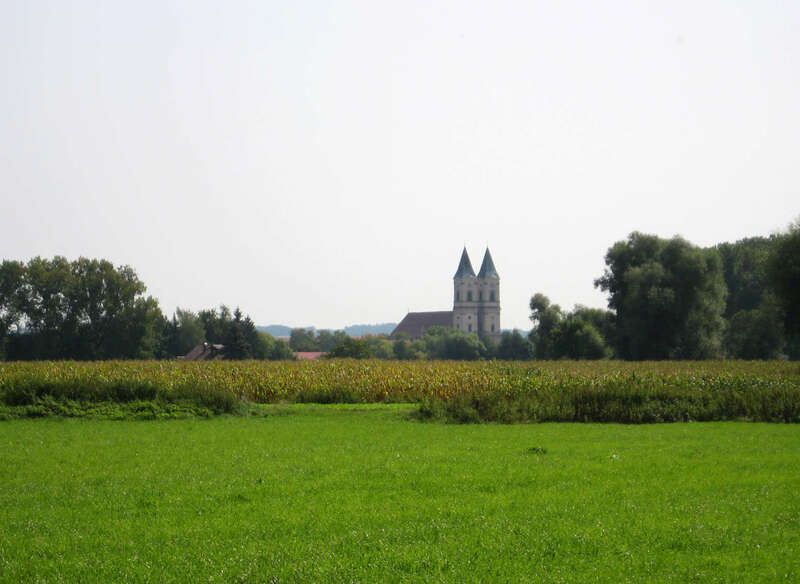 A twin towered church off across the corn fields. At Niederalteich we had lunch on a parkbench while watching the ferry take cyclists across to the other side in a very informal arrangement. 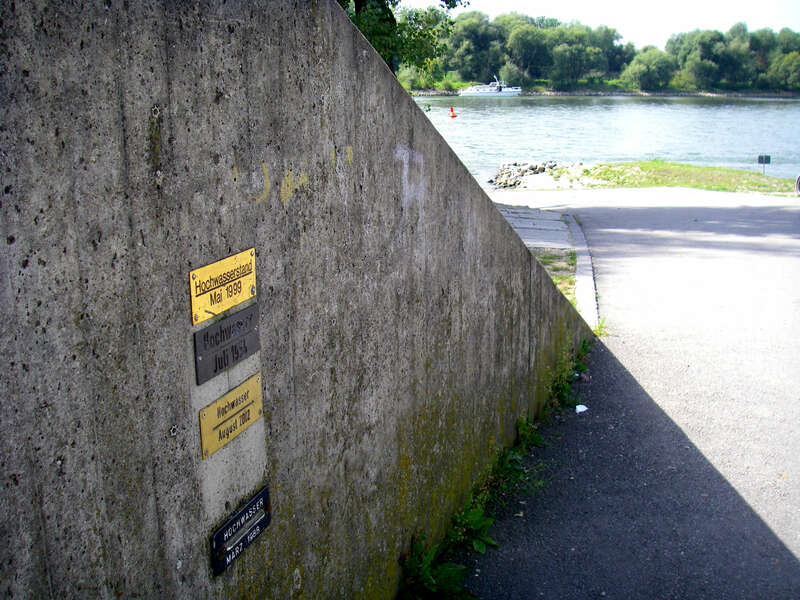 You could cross here and take the right bank route into Osterhofen. 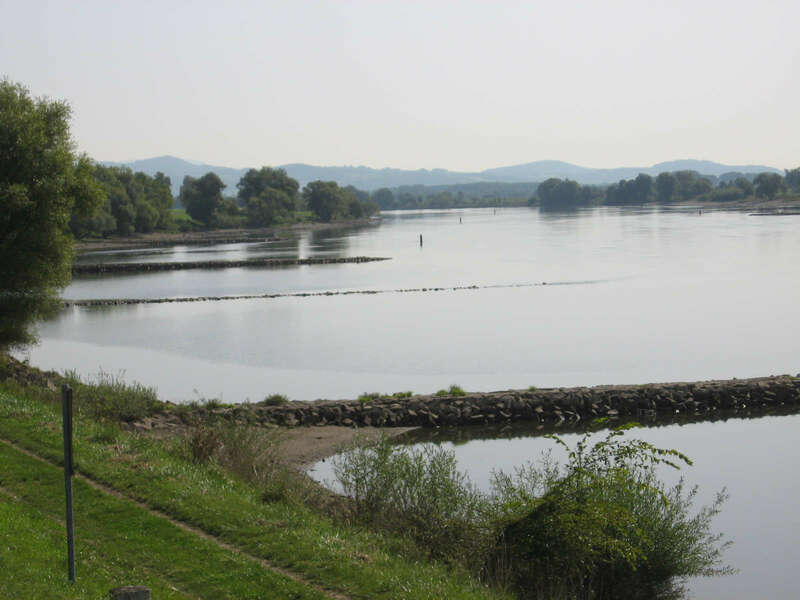 The levee bank is broken here to allow cars to park near the ferry access. They have a system of metal gates in the levee to hold back the waters from the village during a flood. 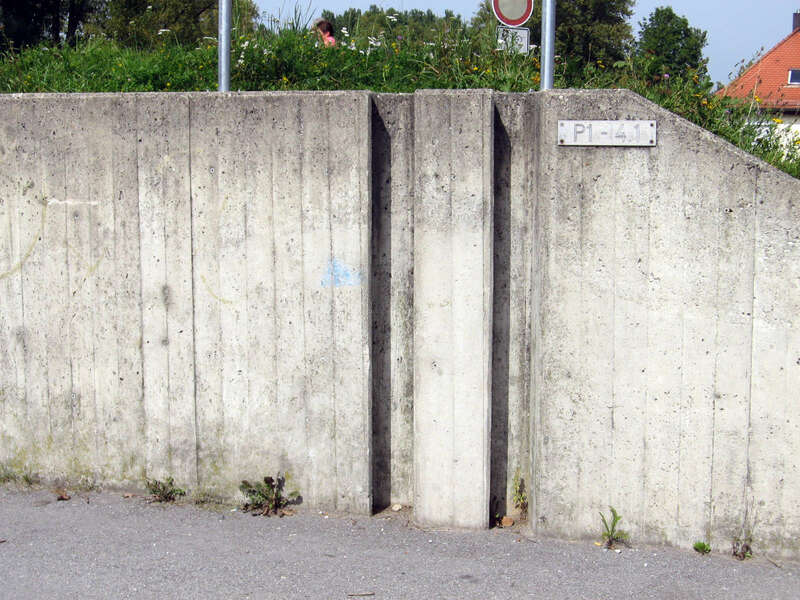 The townsfolk had shown the various heights of floods marked on the concrete walls. 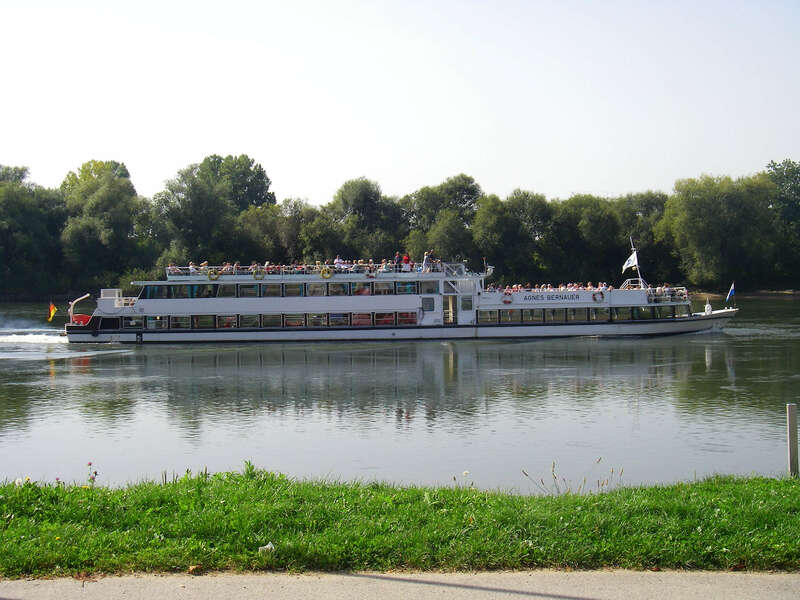 We decided to stay on the left bank as we would be camping on this side of the river. We had lunch and watched this little punt for cyclists and pedestrians cross and recross the river. 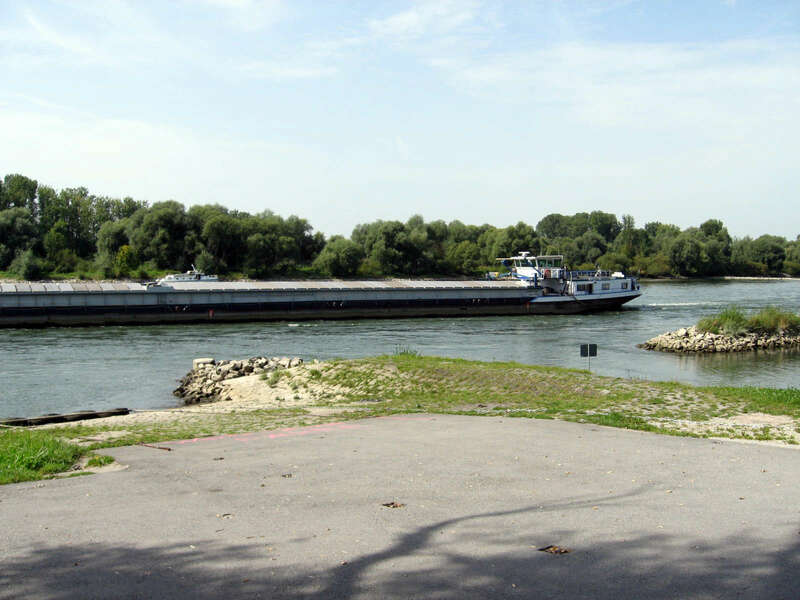 Large barges went up and down the river. The Danube floods regularly, and this area is a convenient place to keep a record when the water recedes. This appears to be the support for a large, strong door which is dropped into the grooves when a flood threatens, to maintain the integrity of the levee banks. 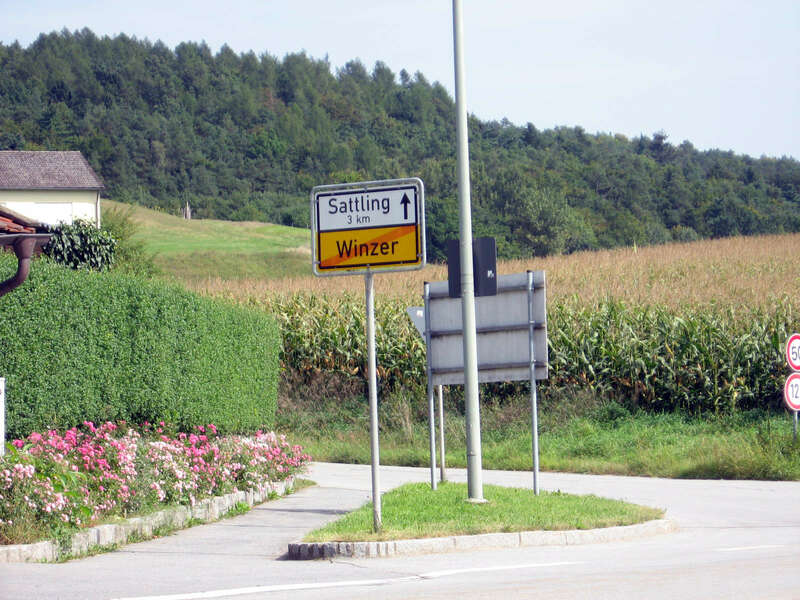 Half an hour later we had passed through Winzer, and were on our way to Sattling. ...and half an hour later after that we had reached the camping grounds at Nesslbach. We took the backpacks off the cycles and went looking for a beer, since there would be no hot water for showers and washing for a while, until they fixed the hot water system. 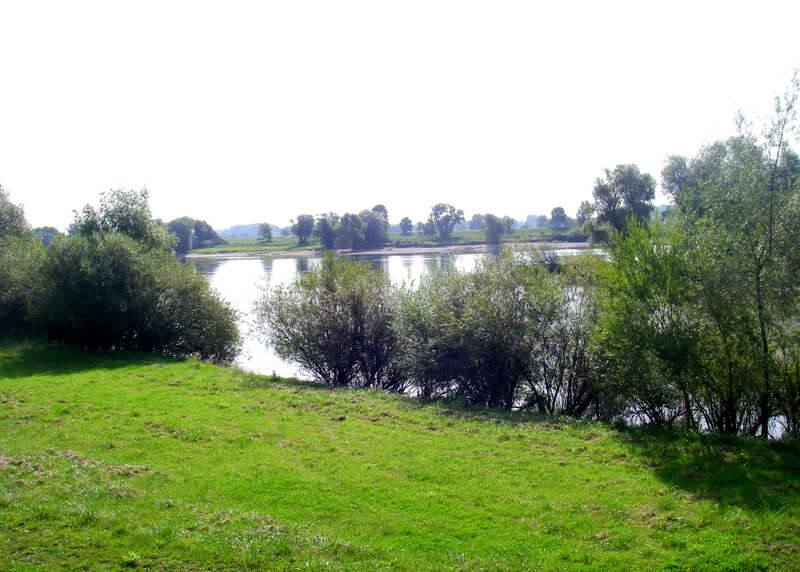 We then followed the river again, cut across country at Osterau, followed the riverbank past Winzer and then headed inland towards Nesslbach where there was an excellent camping area near some sporting fields. 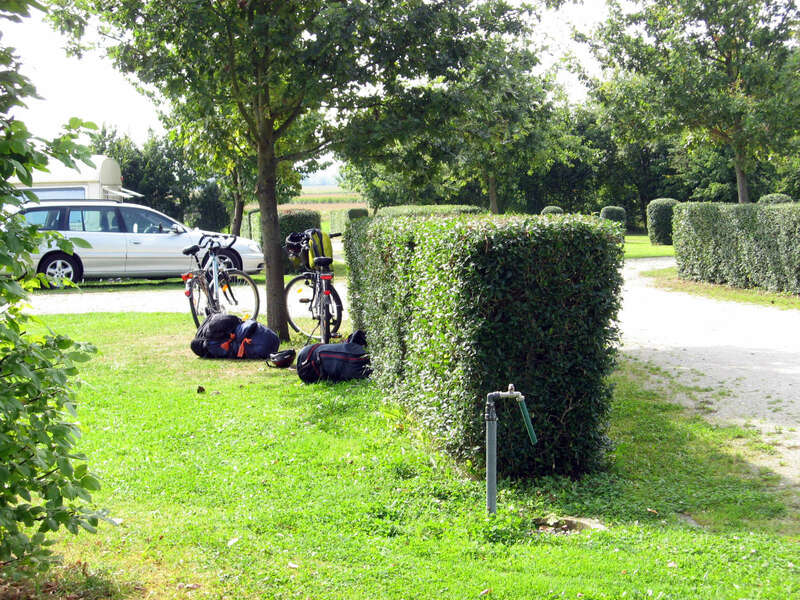 There were plenty of spare campsites so we set up close to the facilities. 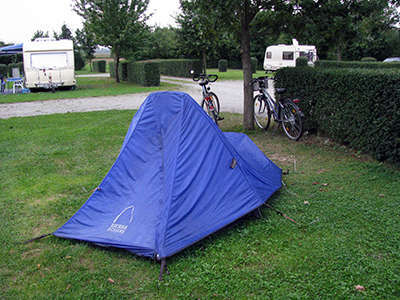 The camping ground was having a problem with the hot water service so we had to wait for our shower. 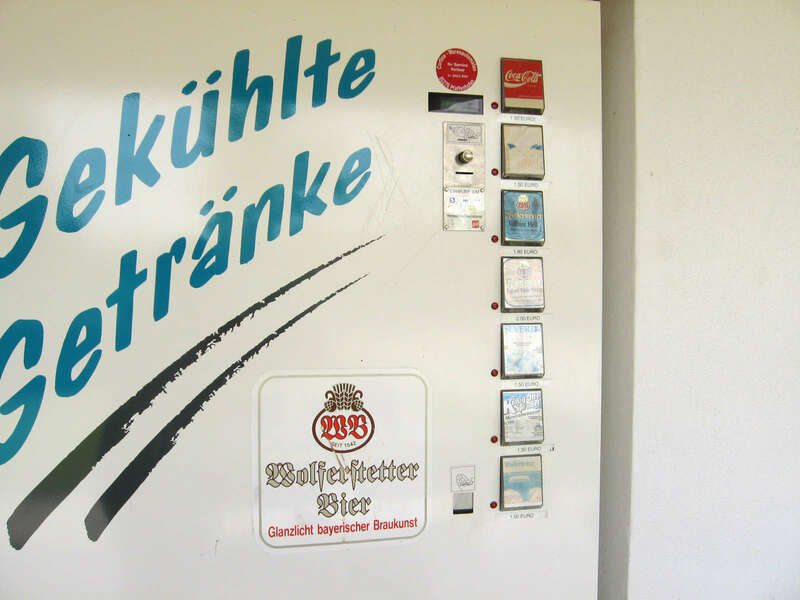 After setting up we relaxed with a beer from the vending machine (would never happen in Australia) and waited for the electrician to fix the problem. A half-hour later we had hot water for showering and washing clothes. We then draped our wet clothes over the wonderful hedges to dry in the afternoon sun and went for a walk into the village, watching the local boys train for football along the way. The camp had a very civilised beer dispenser! We set up the tent and did some washing. 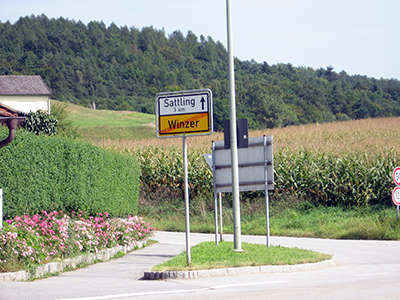 It was a very quiet place and not as prosperous looking as some of the villages we had passed through. 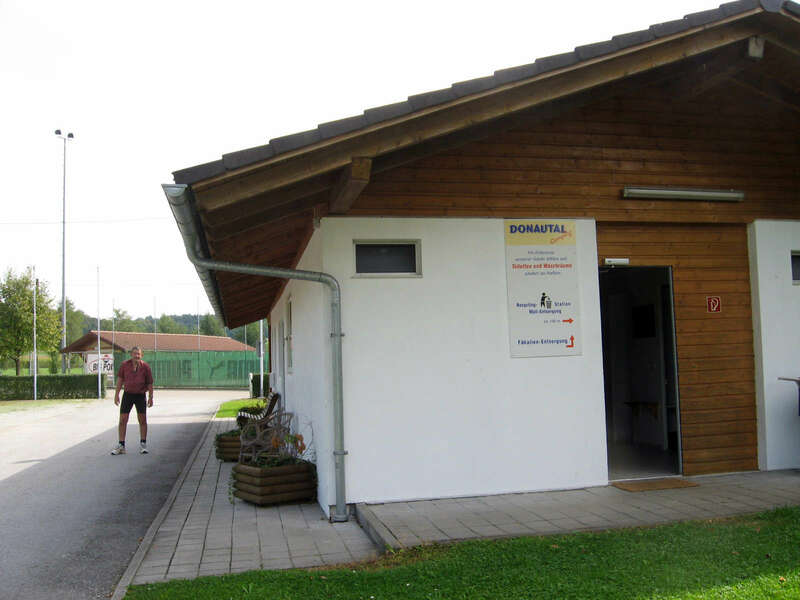 We noticed that the Gasthaus was closed for the day which was awkward as we had no food left and there didn't seem to be a food shop in the place. Back at the campsite we were advised to ride into Sattling and try the Gasthaus there. 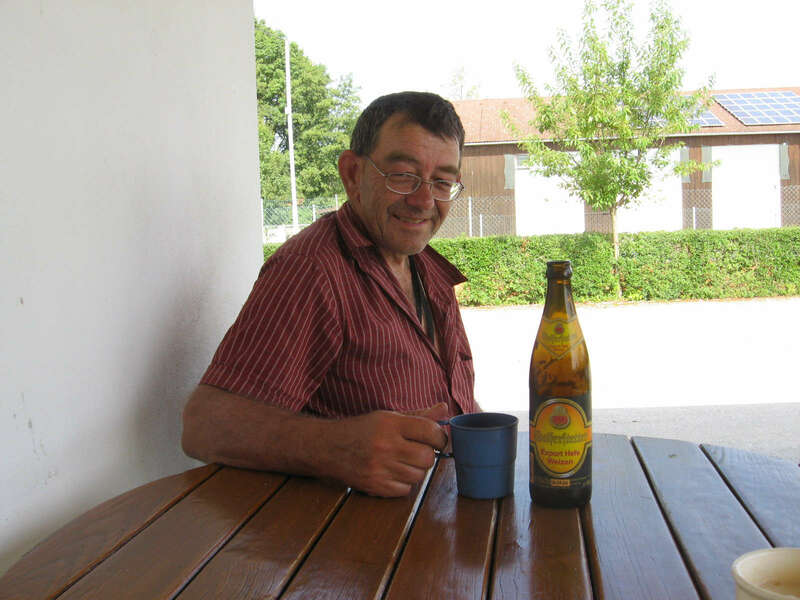 It was only a short ride along the Radweg to Sattling but the Gasthaus was quite deserted, due to the World Cup preliminary game - Germany vs Finland that night. Everyone was at home glued to their TVs. Somehow an Australian pub would have the game up on a big screen and the place would be full. 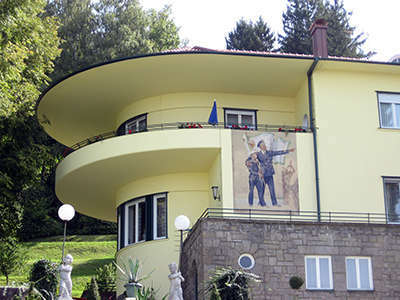 The lady assured me we could have a meal and called the chef to come round. It was a very authentic but also quite kitsch-looking beer garden that had been covered in. The chef was very Bavarian complete with a handlebar moustache. He prepared Vesper for us - a platter of local sausages, cheeses and bread. 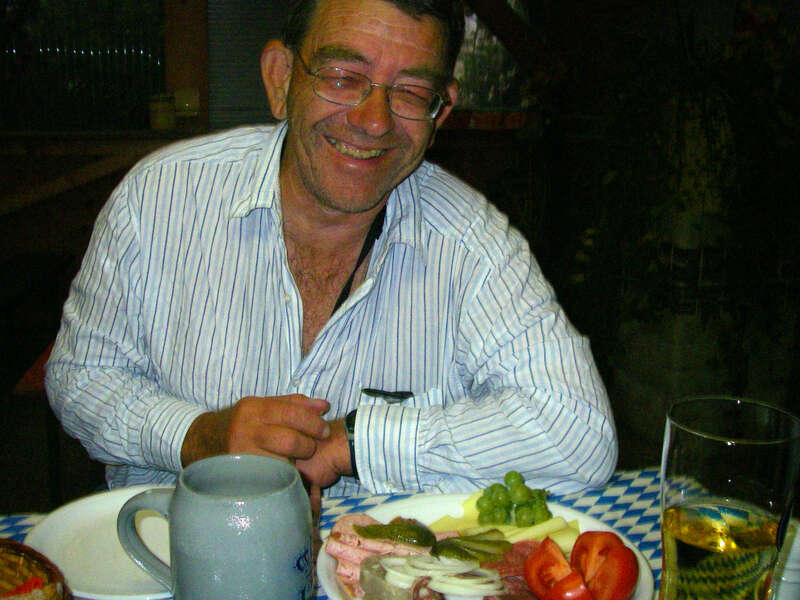 This was washed down with his favourite Beer. 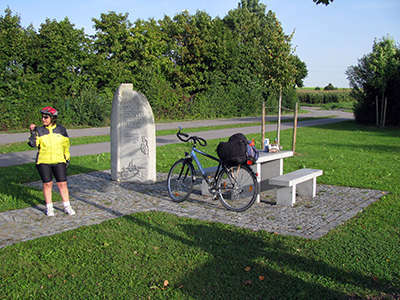 It was quite an evening and we cycled home in the almost dark along the Radweg using our headlamps to give more light. 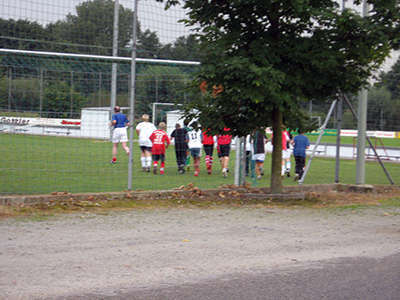 The closed Gasthaus and football training. It was just as well we worked it off during the day by cycling!